The National Housing Bank and Housing and Urban Development Corporation (HUDCO), which are the nodal agencies for the subsidy scheme, are implementing the scheme through various banks and housing finance institutions. The Government of India launched a home loan subsidy scheme for urban dwellers in August 2016. The National Housing Bank and Housing and Urban Development Corporation (HUDCO), which are the nodal agencies for the subsidy scheme, are implementing the scheme through various banks and housing finance institutions. The scheme offers a subsidy of 6.5% on the interest on home loan, subject to or a maximum amount of Rs 2.20 lakh, depending on the rate of interest. Hence, if the rate of interest on the home loan is, say, 8.5%, the actual rate of interest payable by the borrower is just 2.5% (8.5% less 6.5%). The scheme can be availed by persons belonging to economically weaker section (EWS) whose annual household income is less than Rs 3 lakh and by those belonging to lower income group (LIG) whose annual income is between Rs 3 lakh and Rs 6 lakh. The maximum age limit for the scheme is 70 years. Also, the maximum loan amount eligible for subsidy is Rs 6 lakh and the maximum tenure of loan is 15 years. The maximum size of the house should not exceed 30 sq. metres (carpet) for EWS applicants and 60 sq. metres for persons belonging to LIG. The loan can be availed for the purpose of buying under-construction or ready-to-occupy home from a builder or for self-construction of a new house or extension of an existing house. To be eligible, the borrower should not have any home in his/her own name or in the name of his/her family members. Disclaimer: The contents herein is specifically prepared by ‘Dalal Street Investment Journal’, and is for your information & personal consumption only. India Infoline Limited or Dalal Street Investment Journal do not guarantee the accuracy, correctness, completeness or reliability of information contained herein and shall not be held responsible. 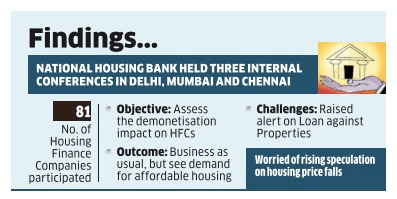 MUMBAI: Housing finance firms downplayed stress in the real estate sector as fallout of the sudden demonetisation early last month in meetings with regulator National Housing Bank, but fear consumer sentiment expects prices to fall, and that could hamper home sales in the coming months, crimping growth, multiple sources familiar with the matter told ET. Kalyanaraman did not elaborate on the challenges but some participants said they drew the regulator’s attention to escalating consumer expectations on falling prices. Rental yield and mortgage loan yields have fallen to about 3.4% (tax adjusted), which could be a key trigger to rake up housing demand from home buyers living in rented accommodation now, a head of a large HFC said. Many consumers are holding back their decision as they expect sharp fall in prices.This could hurt home loan demand, they said, seeking NHB’s intervention to scotch such speculation. The regulator believes that there could be some short term corrections (10-15%) in home prices but it would eventually rise when genuine tax payers line up for transparent deals. The regulator encouraged HFCs to promote small value affordable housing finance loans to coax salaried people being keen on buying homes. “We do expect a surge in affordable housing both on supply and financing side,” said Kalyanaraman, thanks to falling interest rates, higher transparency with RERA (Real Estate Regulation Act) and expected lower land prices. Indian Housing Finance Companies (HFCs) need to work on underwriting standards for affordable home loans to control credit risks, according to Moody’s. The observation becomes crucial, at a time when the government is pushing for an increase in home ownership among underprivileged groups. Affordable housing loans — which are mortgages for low-income earners — are typically opted for by first-time home buyers, usually self-employed in small unregistered enterprises or working for small companies. Key credit considerations for HFCs while giving such loans include income assessments. Some HFCs prefer to extend loans to the specific building projects of construction firms that they have pre-approved, Moody’s said. The affordable housing loan market is forecast to grow to Rs 8 lakh crore by 2022 from Rs 59,300 crore in March 2015, bolstered by government measures. Affordable housing loans accounted for 14 per cent of the total home loan books of HFCs as on 31 March 2015. “This segment presents unique credit risks for lenders, and when securitised, for residential mortgage-backed securities because of the nature of the borrowers,” said Georgina Lee, assistant vice-president at Moody’s. Many borrowers do not have previous banking transaction records and, for the self-employed, they do not disclose their incomes or file tax returns. As such, the formal documentation or records needed to verify income and the ability to service loans is absent, similar in some ways to “low-doc” mortgage loans in other jurisdictions. MUMBAI: The National Housing Bank is considering allowing lenders to levy pre-payment penalty on housing loan customers who transfer the outstanding amount to another lender in the first two years of the loan tenure, a dampener for borrowers wanting to make the most of falling interest rates. Sriram Kalyanaraman, chairman of National Housing Bank, the regulator for housing finance companies (HFCs), believes that home loan ‘shopping’ could lead to risks building up in the system as banks and HFCs are vying for the same customers to expand their market share. In October 2011, NHB had waived off prepayment penalty on money borrowed from housing finance companies on floating rate. So, borrowers could prepay the loan by borrowing from a bank or a nonbanking finance company while moving to lower interest rates. The following year, the Reserve Bank of India barred banks from levying foreclosure charges, or pre-payment penalties, on home loans with floating interest rates. In 2014, the RBI asked banks not to levy pre-payment penalties or foreclosure charges on all floating rate term loans sanctioned to individual borrowers. Other than housing, floating loan products include corporate, vehicle and personal loans. Earlier, banks were charging pre-payment penalty of up to 2 per cent of the outstanding loan amount. Banks, HFCs and non-banking finance companies try to woo customers with lower interest rates. As loan demand from corporates is yet to pick up, lenders are focusing on their retail portfolio, especially home loans, which is more secured lending. The housing loan market continues to be dominated by the five large groups — SBI Group, HDFC Group, LIC Housing Finance, ICICI Group and Axis Bank. Together they accounted for 60 per cent of the total housing credit in India on December 31, 2014. Since then, a number of new HFCs have emerged in niche segments like affordable housing and self-employed customer segments, growing at more than 50 per cent and slowly gaining market share, according to recent report by rating company Icra. With competition intensifying, lenders have dropped rates after the recent policy action by the RBI. SBI had recently cut its base rate by 40 bps but raised spreads on home loans so borrowers can look for loans at 9.55 per cent. HDFC, which prices home loans over a retail prime lending rate, had reduced rates by 25 basis points to 9.65 per cent. The RBI has cut the repo rate by 125 basis points since January this year, while banks have reduced base lending rates by 50 basis points. The Icra report said the government’s focus on affordable housing and favourable regulations could push overall housing credit growth to 20-22 per cent from financial year 2015-16. The National Housing Bank (NHB) has granted permission to six new entities to become housing finance companies. These six companies are Supreme Housing Finance, Nivara Home Finance, Khush Housing Finance Private, Bajaj Housing Finance Capri, Global Housing Finance Pvt Ltd and Hinduja Housing Finance Ltd, NHB said in a release today. “Thus, as on date, the total number of HFCs registered with NHB is 72. New HFCs aim to focus mainly on the affordable housing finance segment and are likely to cater the housing loan needs of the EWS/LIG segment, contributing to achieving the goal of housing for all by 2022,” it said. Earlier this week, RBI allowed banks to give home loans up to 90 per cent of the value of the property that cost below Rs 30 lakh. Earlier, the facility was available only in cases where the cost was up to Rs 20 lakh. This will benefit those who plan to purchase properties in the range of Rs 20-30 lakh. Following RBI’s notification, NHB too lowered loan-to-value ratio for affordable housing loans to 90 per cent. 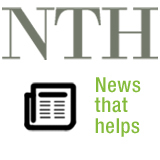 No housing finance company should grant housing loans to individuals up to Rs 30 lakh with LTV ratio exceeding 90 per cent, NHB said. For loans above Rs 30 lakh and up to Rs 75 lakh, LTV ratio cannot exceed 80 per cent, it said.